I have never lost my appetite for new music as I’ve gotten older; my tastes may have sharpened, altered, and gone underground at times, but I have never veered far from the first rock records I coerced my mom into buying me. Every year for the past 5 years, I have analyzed how the GRAMMY rock nominations have stacked up against my tastes, and this is the most excited about the nominations I have ever been. The Best Rock Performance nominees include the soulful Alabama Shakes’ “Always Alright”, the influential envelope-pusher David Bowie’s “The Stars (Are Out Tonight)”, newcomer Imagine Dragons’ “Radioactive”, Led Zeppelin’s “Kashmir” from their legendary reunion concert, desert rockers Queens of the Stone Age’s “My God is the Sun”, and Jack White’s “I’m Shakin'” from his solo album. While Alabama Shakes has been a pleasing addition to the rock community, I am a lifelong Bowie fan, and White has helped keep rock music on the map throughout the past decade in several incarnations, I have a hard time deciding between the QOTSA track and Zeppelin. I think the latest QOTSA album is their best work…but, ultimately, no one can touch Zeppelin, and especially “Kashmir”. My pick: the Golden God, Zoso, Bonzo, and Jonesy. The Best Metal Performance nominees are Big 4 thrash legends Anthrax’s “TNT”, Black Sabbath’s “God Is Dead?”, from their comeback album, prog metalers Dream Theater’s “The Enemy Inside”, Killswitch Engage’s “In Due Time”, from their first album back with their original singer, and Danish band Volbeat’s “Room 24”, which features the legendary King Diamond. While I have banged my head to all of these bands at their shows within the past year, I would have to say that Sabbath and Volbeat rise to the top for me. My pick: Iommi, Geezer, and Ozzy. The Best Rock Song nominees include “Ain’t Messin ‘Round” by guitar guru Gary Clark Jr., “Cut Me Some Slack” from the Sound City Players Dave Grohl, Paul McCartney, Krist Novoselic, and Pat Smear, “Doom and Gloom” by The Rolling Stones, “God Is Dead?” by Black Sabbath, and “Panic Station” by Muse. This is a tough one, but I have to go with what I thought would never happen. My pick: Beatlvana. The Best Rock Album nominees are Black Sabbath’s 13, David Bowie’s The Next Day, Kings of Leon’s Mechanical Bull, Led Zeppelin’s Celebration Day, QOTSA’s …Like Clockwork, and Neil Young with Crazy Horse’s Psychedelic Pill. This category’s like trying to pick a favorite child. If I were looking at the course of each artist nominated’s work, then I would select “…Like Clockwork” as the strongest effort from QOTSA. But, that live recording from that legendary band might still reign supreme. My pick: Celebration Day. I also have to mention that my favorite band, Nine Inch Nails, who in years past has been nominated in the metal category, is nominated for Best Alternative Music Album for Hesitation Marks. Who do I think is missing from this year’s nominees? This was quite the year for rock albums. Nick Cave & The Bad Seeds’ Push the Sky Away is fantastic, Deftones’ Koi No Yokan is brilliant, Carcass’ Surgical Steel is immense, and, for the Alternative category, Depeche Mode’s Delta Machine and Atoms For Peace’s AMOK would be my top choices. This year, the only rock nominee that shows up in the General Category is Imagine Dragons, who is nominated for Record of the Year for “Radioactive”. Best Engineered Album, Non-Classical, features two rock acts: Alice In Chains’ album The Devil Put Dinosaurs Here, and QOTSA’s ...Like Clockwork. The Best Compilation Soundtrack for Visual Media features two rock-related nominees: The Muscle Shoals documentary soundtrack and the Sound City: Real to Reel soundtrack. Jack White’s “I’m Shakin'” is nominated for Best Music Video. Best Music Film has Green Day’s ¡Cuatro! as a nominee. Best Recording Packaging has two rock nominees: Metallica’s Through the Never soundtrack and Bowie’s The Last Day. Best Boxed or Special Limited Edition Package has The Rolling Stones nominated for The Brussels Affair. Producer of the Year, Non-classical has two nominees who worked on several rock records, Rob Cavallo and Jeff Tweedy. The Surround Sound category features a nomination for Primus’ Sailing the Seas of Cheese (Deluxe Edition). In summary, this year’s top headbangin’, hip swayin’ rock records belong, rightfully so, to Queens of the Stone Age, Black Sabbath, Led Zeppelin, Jack White, and David Bowie. Who will be selected as the winners amongst winners? I’ll be there to bring it all to you live, at the 56th Annual GRAMMY Awards, on January 26th. 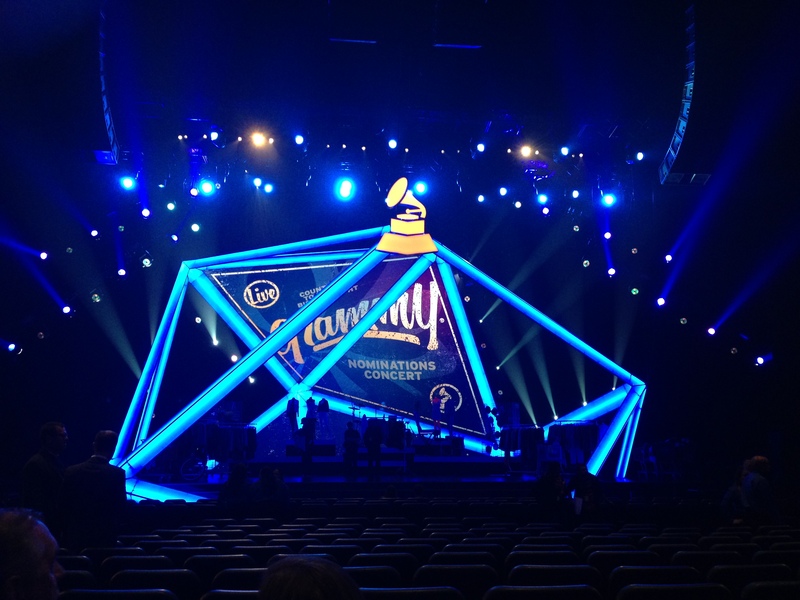 If you would like to learn more about how the GRAMMY selection process works, go here. Listen to the nominees in my spotify playlist!